Window films have come a long way since they were first developed in the early 1970’s. Through advanced engineering and production technologies, today’s window films can provide a combination of energy savings, UV protection, glare reduction, additional security, and aesthetic enhancements. To give you an idea of the technology involved in producing a window film, consider that many solar films are a mere 2-mil thick (or .002 inches! ), yet they contain as many as 40+ different layers of metals. If you’re sitting at your desk right now, look around for a stack of post-it notes. Pick up those post-it notes and imagine each note representing a layer of metal specifically designed to block light, glare, or solar heat, while precisely controlling the overall appearance of the film. A nanotechnology production technique called sputter-coating will magnetize different metals onto a sheet of clear PET (Polyethylene Teraphthalate). Once the right layers of metals are applied, one of two types of adhesive are used to bond the film to your glass. A pressure-sensitive adhesive (PSA) is common with many commercially available films, but water-activated adhesive is also an option. Both types of adhesive will create a chemical bond between the glass and your film, so installation is strong enough to prevent unintentional removal. A trained window film professional can always un-install your film and bring the glass back to its original condition. Now that we understand the basic components of a window film, let’s go through some of the main benefits for window film at your building. Energy savings tends to be a top priority for building owners and occupants. Building owners want to keep their heating and cooling costs as low as possible, and building occupants will often complain about varying temperatures throughout their space. Applying window films to your exterior windows allows you to consistently control the heat throughout your building. Many tenants will use space heaters in individual office spaces during the winter AND summer months, because the HVAC system is working over-time to bring the entire space up (or down) to a comfortable temperature. Window film can minimize the inconsistencies throughout your space, which making your tenants more comfortable and reduces the loads on your HVAC system. To prove the benefits of window film, Signals Defense can model your building to determine the ideal window film for your glass. We make this determination by looking at your current energy consumption compared to other buildings similar in size and age, a walk-through your space to identify any issues on-site, and temperature monitors on your glass (with and without film). During the evaluation process, we can also determine if you’re eligible for any state tax credits to cover the initial installation costs! Ultraviolet (UV) rays are sneaky. Not only are they known to cause skin cancer and wrinkles, but they can reflect off different surfaces to attack your body. According to the Skin Cancer Foundation, drivers in the USA develop more skin damage on the left side of their body than drivers in countries that drive on the other side of the road. The reason for this anomaly – the consistent exposure to UVA and UVB rays through the side windows in their car! 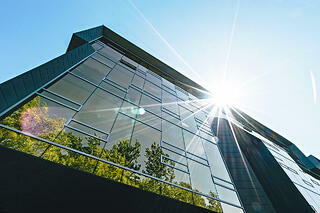 Window films for your cars or buildings will block 100% of harmful UV rays, without reducing visibility. If you don’t put window film on your building, at least consider providing sun screen for your tenants with window offices! Solar films can provide a consistent look to your building, regardless of whether space on one floor is occupied or empty, and regardless of whether one tenant decides to have their shades up while the other has their shades down. Architects and developers spend thousands of hours to design a building, yet once its built and occupied the entire façade can change depending on what floors have lights on or off, and what tenants decide to keep their shades up or down. Avoiding this “checker board” look is simple with window film. Last, but certainly not least, is the safety and security of your tenants and their space. Many solar films are available in thicker versions incorporating bomb and blast rated security with the solar performance. Compared to a standard 2-mil thick solar film, a solar/safety film could be anywhere from 6-mil to 15-mil or more in thickness. When these films are professionaly installed to manufacturer’s specification, your building’s existing glass will sustain wind speeds up to 170 miles per hour. Whether you want to prepare for a seismic event, protect against spontaneous glass breakage, or bring your glass up to code safety film is a quick and affordable option compared to replacing your windows. For more information about any of these benefits, or to set up a time to have your building evaluated, please contact us!